Figure 1. The B4SS Project’s Governance System. The Global Environment Facility (GEF) is the funding body for the Biochar for Sustainable Soils (B4SS) project. Established in 1992 at the Rio Summit, the GEF provides financing to eligible countries for costs of generating global environmental benefits. The United Nations Environment Programme’s Division of Environmental Policy Implementation (UNEP DEPI) is the Implementing Agency for this project. 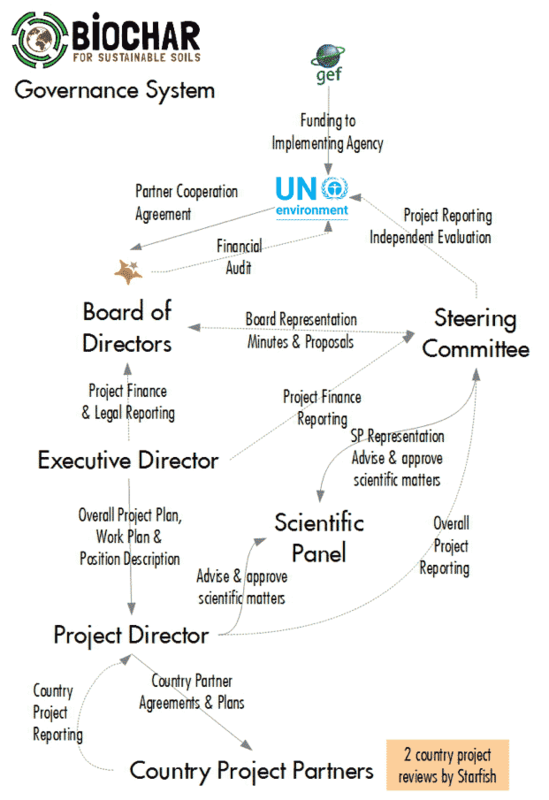 As such, UNEP DEPI is responsible for coordinating activities, monitoring the implementation of UNEP’s standard monitoring and evaluation procedures, and transmitting financial and progress reports to the GEF. Starfish Initiatives is the Executing Agency, whose purpose is supporting and creating regional sustainability through a growing range of innovative governance, strategy, collaboration, community enterprise, communication and learning systems and practices ~ each of which is designed and developed specifically for sustainability in a rural, regional or remote setting. Project partners, country coordinators and in-field personnel will report to the Steering Committee, through the project director, as well as participate in coordination meetings from time-to-time to ensure the integrity and quality of the project. The role of the Scientific Panel is to ensure the scientific integrity of the B4SS project by reviewing and approving project plans, publications, and progress reports to UNEP. Their members provide ad-hoc specialist advice to the B4SS project director and country coordinators from time to time. When required, the members of the Scientific Panel pay a visit to the project countries to assist in the design, establishment and analysis of biochar experiments, and production and application of biochar formulations to soil – among other tasks. The Project director coordinates the project through the country coordinators. This key role includes knowledge management and the integration of baseline projects across the countries involved. This role will also work directly with the in-country project coordinators through planning, implementation, monitoring and evaluation. New knowledge, know-how and key messages will be identified through a facilitated process led by the project director and involving project partners, personnel plus monitoring data and analysis. This interactive exchange of knowledge and know-how will be woven throughout the project, as well as include communication strategies for disseminated more widely. Each country coordinator will be responsible for the management and implementation of the baseline and B4SS project activities. Key messages will be disseminated to a broad audience through the website and development of the good practice guide for using biochar in Sustainable Land Management.